Furukawa T, Tanimoto K, Fukazawa T, Imura T, Kawahara Y, and Yuge L, Simulated microgravity attenuates myogenic differentiation via epigenetic regulations, NPJ Microgravity. 2018; 4: 11. Otsuka T, Imura T, Nakagawa K, Shrestha L, Takahashi S, Kawahara Y, Sueda T, Kurisu K, Yuge L, Simulated microgravity culture enhances the neuroprotective effects of human cranial bone-derived mesenchymal stem cells in traumatic brain injury. Stem Cells Dev. 2018 Jul 5. Imura T, Nakagawa K, Kawahara Y, Yuge L, Stem cell culture in microgravity and its application in cell-based therapy. Stem Cells Dev. 2018 Aug 7. A Microgravity Simulator that NASA Kennedy Space Center introduced! Microgravity provides a special environment where cells grow without sedimentation and convection. Several studies have shown that the formation of 3D aggregates after the cells were cultured under microgravity conditions. The 3D multicellular spheroids or tissues represent more physiologically relevant in vivo situations needed for biomedical research and drug development. 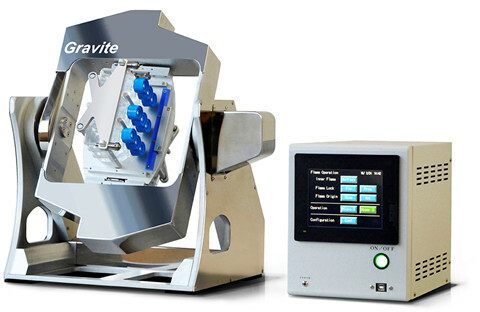 Gravite® is a multi-directional gravity device for simulating microgravity and hyper-gravity. By controlled rotation of two axes, the 3D clinostat minimizes the cumulative gravity vector at the center of the device and makes 10-3 g over time average. Gravite® can also create a hyper-gravity environment of 2-3 g by centrifugal force from one axis rotation. 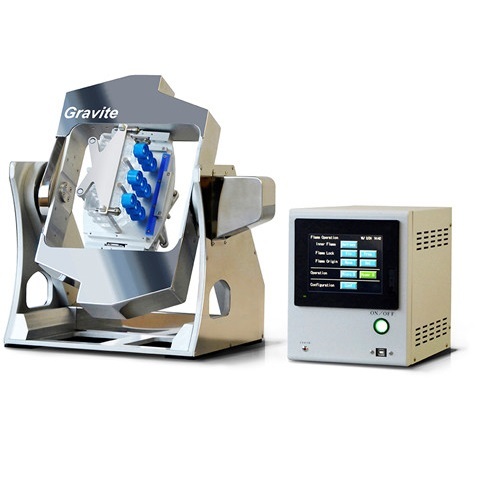 Gravite® is an ideal tool that provides the simulated microgravity environment with real-time gravity monitoring for biological studies. Main Unit External and internal frames are rotated. Samples were mounted in the center of device. Control Unit Control and monitor the rotation of Main Unit. Open sample holder for culture plates. Gravite® is a multidirectional G-force generator controlling rotation of two axis simultaneously. This unique feature allows cancellation of cumulative gravitional vector at the center of the device to create 10-3g as same as ISS. Gravite® can also rotate one axis to create an environment of 2-3g. Gravite® can monitor real-time gravity using acceleration sensors. Gravite® can be set up in CO2 incubator with 37°C and 95% humidity. A microgravity simulating device has a wide range of applications and help scientists test their hypothesis that were very expensive or difficult to do so before. The following list are just some examples of them. The microgravity and hypergravity environment simulated by Gravite® is opening a new avenue for, but not limited to, almost all of biological and chemical studies. Figure 1. 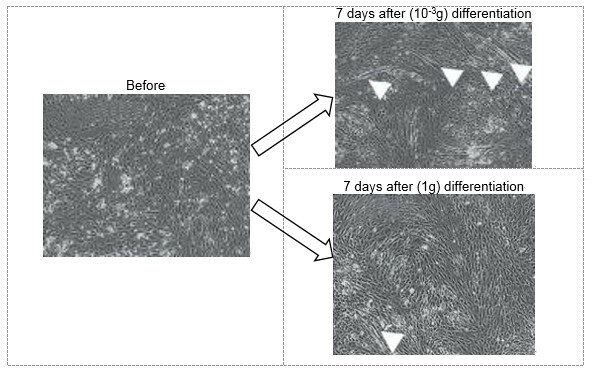 Morphological changes of cultured mouse ES cells on Day 3 and 7. All the cells became oval cell shapes and flattened, the phenotype of differentiated ES cells in group 1G (a, b). The cells of group CL showed the formation of cell spheres (c, d). Figure 2. ALP staining of group 1G (a) and group CL (b), on Day 7. The cell spheres of group CL were positive for ALP. The cells of group CL expressed undifferentiated cell markers (c). *Kawahara Y, Manabe T, Matsumoto M, Kajiume T, Matsumoto M, et al. 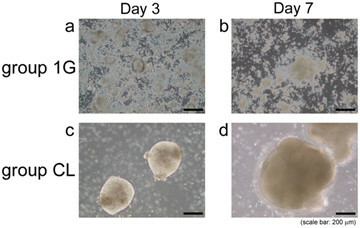 (2009) LIF-Free Embryonic Stem Cell Culture in Simulated Microgravity. PLOS ONE 4(7): e6343. Example 2*: Myoblast differentiation was inhibited under 10-3g with Gravite®. *Data was from Dr. Louis Yuge at Hiroshima University. AS ONE INTERNATIONAL, INC. is an exclusive distributor for the markets of the United States and rest of world (except in Japan). Please click and fill in the contact form, we’re ready here to help you exploring a new world in biology with the best microgravity simulator Gravite®.